Visitors experience digital and video works in small groups as the exhibition moves between communal and individual presentations. 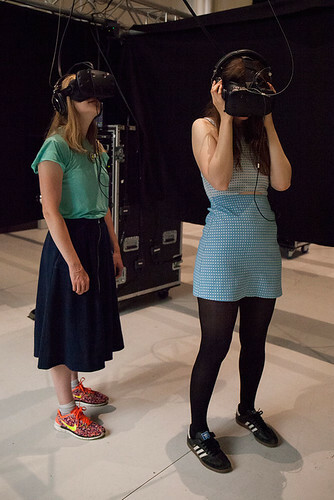 Some rooms are set out as cinematic experiences; others provide personal Virtual Reality (VR) performances, which are experienced by putting on a VR headset suspended from the ceiling, or being placed on a swivelling stool (to mobilise the viewer for the 360 degree image / soundscape). Installation image from ‘Björk Digital’, taken by Santiago Felipe. 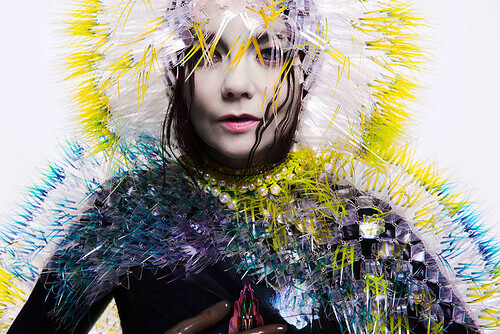 Top: Björk, Vulnicura album art. One of the paradoxes of VR, still a comparatively new technology, is that you enter the immersiveness of the virtual world while being deprived of your senses in real life. Putting on the headset is a slightly clunky way to set up a potentially transcendent experience, but the results are compelling. Still from Stonemilker VR, made in collaboration with Andrew Thomas Huang. Notget VR, courtesy Rewind VR. Once you enter the Icelandic landscape of Stonemilker VR, made in collaboration with Andrew Thomas Huang, or the ethereal floating space of Notget VR, made with Warren du Preez and Nick Thornton Jones, the experience can feel anything from unnerving and uncanny to transformative. In Stonemilker Björk appears in multiple forms on a desolate landscape – appearing, disappearing and circulating around you in an imploring and personal manner as her clothes flutter in the wind. 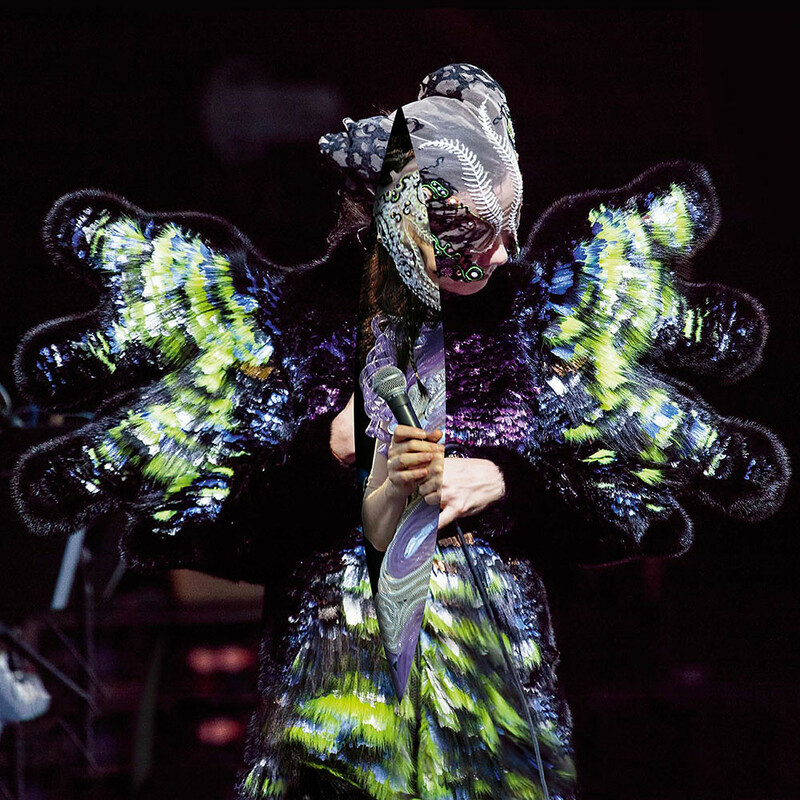 In Notget, a transparent Björk transforms into a giant moth aided by masks designed by embroidery artist James Merry, mixing textile design with digital threads of light. Black Lake. Photo: Andrew Thomas Huang. Black Lake (also made with Andrew Thomas Huang) is a cinematic space for up to 25 people with a specially constructed sonic environment, in which you are encouraged to move around to fully experience the performance. This space feels as immersive as the VR presentations because the sound is so enveloping. The success of this piece comes partly from the way the Icelandic landscape matches the soundscape – an aspect of Bjork’s music that dates back to Homogenic (1997), which uses huge beats to convey Björk’s homeland though boldly structured sound. The sense of scale is fascinating in the VR performances because the spaces are potentially infinite, floating in space. Some things appear up close, as though you have become part of an organic system where you can see biological matter at a cellular level, while other things appear far away, like stars and other celestial phenomena. A deliberate mixture of the two is core to Björk’s ongoing exploration of biophilia and technology, using digital media to bridge between sensory experience and the environment. Mouth Mantra VR is an collaboration with Jesse Kanda that places you inside an abstracted, vortex-like version of Björk’s mouth. Mouth Mantra VR directed by Jesse Kanda. The final room showcases earlier films made with film-makers including Michel Gondry, Nick Knight, Stéphane Sednaoui and Spike Jonze – Björk has always sought to collaborate with cutting-edge film-makers. These films also suggest how the spectacular type of imagery previously visualised on a conventional cinema screen is increasingly finding form in virtual reality. ‘Björk Digital’ is an innovative way to experience a collection of songs, ranging from the uncanny and the surreal through to the sublime. But the soundscape constructed within each piece remains the strongest part of the exhibition. For all the visual wonder and possibilities of immersion within a set of carefully crafted visual environments, it is the quality of the music that dominates the experience. ‘Björk Digital’ at London’s Somerset House continues until 23 October 2016.